COLOMBO, November 28 – German Ambassador Jens Plötner recently visited the Aitken Spence power plant in Embilitiya, together with Mrs Maria Spoelgen, Vice President of the German Investment and Development Organisation DEG.The 100MW Embilitiya plant is the largest power generating unit operated by Aitken Spence Power,a subsidiary of the diversified bluechip Aitken Spence PLC. agricultural education services to the local community, whose main source of income is agriculture. The company also conducts youth empowerment programs such as the training of young people in bee keeping and sustainable agricultural practices. The plant’s community outreach efforts include the provision of safe drinking water to over 4000 families in the surrounding villages and the realisation of health camps. DEG holds a 26 % stake in Ace Power Embilipitiya (Pvt) Ltd., the plant’s owning company, since 2005. A member of the KfW Bank Group, DEG is one of the largest European development finance institutions with a special focus on co-financing of industrial entities and finance institutes as well as economic cooperation in developing economies and countries in transition. It has had a presence in Sri Lanka since the late 70’s and has successfully provided finance to public-private partnership projects. hydro, wind and waste-to-energy plants either at operational or development stage. The Ceylon Chamber of Commerce (CCC) recently recognized blue-chip conglomerate Aitken Spence PLC as one of the top ten best corporate citizens in the country for the sixth consecutive year. Sri Lanka’s premier business chamber’s “The Best Corporate Citizen Awards” is organised with the intention of “promoting Strategic Corporate Sustainability and CSR within the business sector in Sri Lanka”. The award is open for both private and public entities and the winners are selected through stringent criteria and the shortlisted applicants are required to make a brief presentation and also face an interview. 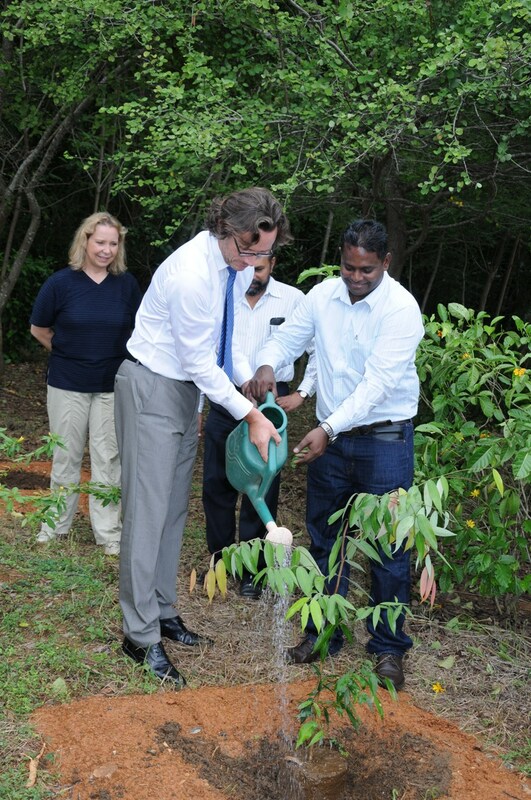 “Corporate sustainability is an ongoing business strategy at Aitken Spence. In contrast to projects-based initiatives, the myriad of aspects and specific systems required for corporate sustainability are being embedded into how we do business. The process of embedding sustainable practices in a highly diversified business is an ongoing challenge, which we committed to,” said Dr. Rohan M Fernando, Director/Head of Business Development & Plantations of Aitken Spence PLC. “Although our strategies to create long-term shared value that benefits our stakeholders are not geared in any way to solicit specific or general recognition, we are sincerely pleased that the Ceylon Chamber of Commerce has rated us amongst its exemplary corporate citizens for six years in succession,” he added. The company’s integrated sustainability policy framework-implemented under the overall direction of the Board of Management and Board of Directors- takes a 360 degree view on corporate sustainability and includes a wide-range of aspects deemed necessary to create sustainable value. Earlier this year Aitken Spence PLC was ranked second and among the handful of companies rated as ‘Platinum’ for the second consecutive year in the STING Corporate Accountability Index 2011. Aitken Spence was the highest ranked diversified holdings company in the index, while the company was also identified as the ‘Best in Class for Policy Coverage’. The index was unveiled by Sri Lanka’s leading business magazine LMD, which stated “few companies have structured and integrated processes to monitor and manage their sustainability – related risks and opportunities. Aitken Spence is amongst the corporates that do this well”. STING Accountability Index rates the LMD 50 companies and 10 key state enterprises on compulsory basis, counting the largest entities in the country in one index. Aitken Spence PLC is among Sri Lanka’s leading and most respected corporate entities with operations in South Asia, the Middle East and Africa. Listed in the Colombo Stock Exchange since 1983, it has major interests in hotels, travel, maritime services, logistics and power generation. The group also has a significant presence in plantations, printing, financial services, insurance, information technology and garments. Aitken Spence is one of the pioneering signatories from Sri Lanka to the UN Global Compact, a strategic policy initiative for businesses that are committed to aligning their operations and strategies with ten universally accepted principles in the areas of human rights, labour, environment and anti-corruption. With over 8700 corporate participants and other stakeholders from over 130 countries, it is the largest voluntary corporate responsibility initiative in the world. Aitken Spence chairs the Global Compact local network board in Sri Lanka, whose role is to root Global Compact principles within the country’s businesses. MMBL Money Transfer (Pvt) Ltd. (MMBL) has appointed Softlogic Finance PLC – the Finance arm of Softlogic Group to offer Western Union money transfer services through their combined network of Softlogic Finance and gold loan centres island wide. MMBL Money Transfer (Pvt) Ltd., a joint venture between Aitken Spence PLC & Mercantile Merchant Bank Ltd is one of Sri Lanka’s leading international money transfer providers connecting Sri Lankans with more than 475,000 Western Union locations in more than 200 countries and territories. Serving Sri Lankans working and living overseas to send money to family and loved one’s since 1993 MMBL’s network of locations are serviced by banks, co-op rural banks, financial institutions and retail outlets such as Jewellery Centers, Pawning Centers etc. Softlogic Finance PLC offers a portfolio of financial solutions encompassing,leasing, hire purchase, business and personal loans, savings and fixed deposits. “Signing up to offer Western Union Money Transfer Services is in line with our expansion strategy to offer a comprehensive suite of services to our Sri Lankan customers” said Mayura Fernando, Director / CEO of Softlogic Finance. “The last six months has seen, Softlogic Finance expand our network and along with our products and services as we grow our customer base to all parts of Sri Lanka,” he said. The Western Union Company (NYSE: WU) is a leader in global payment services. Together with its Vigo, Orlandi Valuta, Pago Facil and Western Union Business Solutions branded payment services, Western Union provides consumers and businesses with fast, reliable and convenient ways to send and receive money around the world, to send payments and to purchase money orders. The Western Union, Vigo and Orlandi Valuta branded services are offered through a combined network of approximately 485,000 agent locations in 200 countries and territories. In 2010, The Western Union Company completed 214 million consumer-to-consumer transactions worldwide, moving $76 billion of principal between consumers, and 405 million business payments. For more information, visit http://www.westernunion.com. Aitken Spence’s port efficiency enhancement and terminal management services arm, Port Management Container Services Ltd. , was one of the three shortlisted listed finalists for the Investment in People award at the inaugural Containerisation International Awards held in London recently. The award attracted 90 applications from companies worldwide. The other two finalists were Port of Salalah in Oman and the Belgium-based multinational Safmarine Lines. Containerisation International is the magazine of choice in the container business world. The magazine has been a leader in its field since it published its first issue back in 1967 and has established itself as the foremost analytical voice on container shipping and provides invaluable news and statistics to the container markets and related businesses. The Containerisation International Awards was the first global ceremony held to acknowledge and recognize the leaders, achievers, and innovators in the container shipping industry who have over the past year made an outstanding contribution by being innovative, proactive and pioneering. More than 200 delegates from the global shipping industry attended the inaugural Containerisation International Awards event held in central London recently. The company said that it received the prestigious award due to their focus on introducing cost effective programmes and best practices to motivate, train and transfer skills to enable their partners/clients to improve productivity at their terminals and also maintain a motivated work force. “This is indeed a remarkable achievement for Port management Container Services who are relative newcomers in the terminal management industry. With the tremendous efforts and hard work put in by the management and the staff of PMCS we have been able to increase productivity levels at the container terminals in South Africa through our tailor-made programmes in increasing efficiency, productivity and quality levels”, said Mr. Iqram Cuttilan, Vice President of Aitken Spence Maritime. PMCS is the first Sri Lankan company to venture overseas in the field of container terminal productivity enhancement. Aitken Spence presently conducts operations in several ports in South Africa and Mozambique. “Our programmes have been very successful and we have been able to cover all the major container terminals in South Africa. It is the intention of PMCS to expand their activities in the other African Ports too”, added Mr. Cuttilan. Port Management Container Services specializes in conducting efficiency, productivity and quality enhancement programmes in container ports and terminals. It also conducts programmes on training the trainer, mentorship, human resource & change management. The programmes which PMCS has conducted are in Best Practices in Container Operations, which is aimed at training container terminal personnel in enhancing, efficiency, productivity and quality in container terminals; Best Practices in Marine Operations, which is aimed at increasing efficiency and productivity in navigational related activities in ports; and Best Practices in Terminal Operations and Ship Planning. It is noteworthy that even though PMCS does not own or manage container terminals, the company’s skills in conducting successful efficiency, productivity and quality enhancement programmes in container ports and terminals has been accepted and recognised by the global containerisation industry. As a pioneering venture in Sri Lanka’s maritime services industry, the recognition will indeed act as a motivational factor to enhance and promote the activities of the company globally. Aitken Spence is a ground-breaking player in Sri Lanka’s shipping and maritime services industry with a heritage spanning over one and a half centuries. 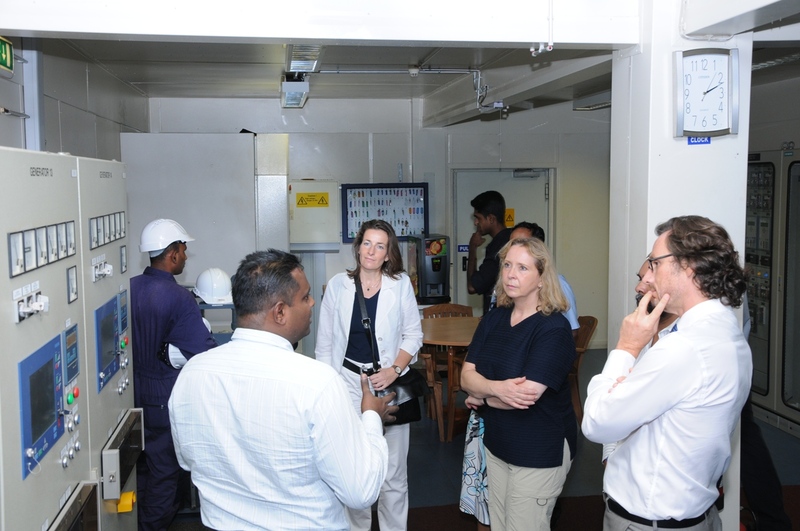 The company’s maritime arm also represents some of the world’s leading shipping lines and partners a consortium which has been awarded the contract to construct and manage the Colombo Port’s South Terminal. Diversified conglomerate Aitken Spence PLC posted a pre-tax profit of Rs. 1.7 billion for six months ended 30 September 2011, an increase of 7.5% from the corresponding period last year. Half-year results released to the Colombo Stock Exchange on Wednesday, show a rise of 8% in group revenue to Rs. 13 billion. Profit attributable to shareholders increased by 8.4% to Rs. 1.1 billion while earnings per share rose by 8.4% to Rs. 2.79, over the corresponding period in the previous year. Aitken Spence is among Sri Lanka’s leading and most respected corporate entities with operations in South Asia, the Middle East and Africa. Listed in the Colombo Stock Exchange since 1983, it has major interests in hotels, travel, maritime services, logistics and power generation. The group also has a significant presence in plantations, printing, financial services, insurance, information technology and garments. While the tourism and cargo logistics sectors contributed positively to revenue, the strategic investments sector showed a decline in revenue for the period under review. “The growth in pre-tax profit was mainly driven by our resort portfolio in the Maldives and maritime services arm, which includes our operations in southern Africa. We are pleased to report strong performance by our printing and garment businesses” said J M S Brito, Aitken Spence PLC’s Deputy Chairman and Managing Director. Two of the Group’s resorts in Sri Lanka in Kalutara and Negombo remained closed during the six months for renovation while the former Neptune Hotel, now rebranded and repositioned as Heritance Ayurveda Maha Gedara was closed during most of the reporting period. Aitken Spence operates an award-winning portfolio of 24 resorts in Sri Lanka, Maldives, India and Oman. “We are pleased to note that internationally the country is seen to be a better location to invest and conduct business. In addition to attracting one of the world’s best known spa operators to invest in our tourism industry, we are looking at attracting major international investments to the country which are expected to break new ground in the Sri Lankan economy. We are confident that the government’s continuing efforts to improve the environment in which businesses could contribute towards strong and sustainable economic growth would assist our efforts to attract greater foreign direct investment into the country” added, Mr. Brito. During the quarter under review, Heritance Hotels and Resorts were crowned the most energy efficient hotel chain in Sri Lanka. Heritance Hotels made a clean sweep of the Large Scale Hotel Sector category, a feat never been achieved in the history of the awards by a single hotel chain. During the period under review Aitken Spence Printing were awarded the ISO 9001 quality certification, a testament to the heritage of quality and reliability by the countries pioneering printing and packaging service provider.